BE SURE TO CHECK OUR FACEBOOK FOR DAILY UPDATES! There are 4 options to register! If you are in the top 3 of your age group . . . a medal! Online registration closes on August 14 at 6:00 PM. Mail-in registration closes on August 9th, 2019. You can also register at Advanced Packet Pick-Up on August 15th, 2019 AND the morning of the event on August 17th, 2019. DO WE REALLY GET TO RUN DOWN WOODWARD? Yes, you’ll be cruisin’ down Woodward wearing your running/walking shoes! NOTE: FREE Parking at lots is for a limited time during the race event. Staying for the Woodward Dream Cruise presented by Ford, or other activities may result in parking fees. Yes. It’s okay to wear headphones. We encourage you to be cautious for safety reasons. Yes. There will be a water stop shortly after you get off Woodward Avenue. • The Woodward Dream Cruise presented by Ford. This event is a free event for everyone to attend. 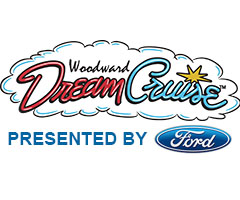 • In addition, nearly 100 area charities benefit from the sale of official Woodward Dream Cruise presented by Ford merchandise and refreshments each year. There are 2 options for Packet Pick-Up. You can also register at these locations. You will receive your bib and tech shirt.